Steven (Chicagoland, United States) on 5 August 2013 in Landscape & Rural and Portfolio. View from inside the Indian Watchtower at Desert View. People can be seen outside at the Overlook below. Photo captured May 8, 2013. I have no words for this shot...bravo. This is so sharp, clean, and crisp Steve, I'm amazed at how much detail your dragging out of these single frames. A spectacular view and beautifully captured ! Very beautiful ! A great light and incredible landscape !! A spectacular view beautifully captured ! Fantastic place. Lovely colors in that warm light. 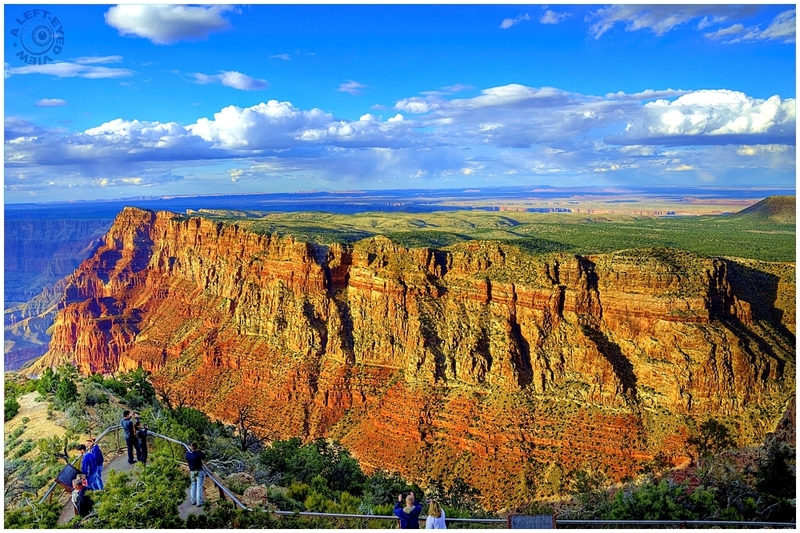 Wow, this is gorgeous with the banding of colors on the land and canyon ... I love this tour! So much beauty to take in, this photo has the WOW factor Steven.... your processing just sings.. the colors are out-of-this-world! You are really giving us a spectacular view of it all.... awesome!! Fantastic light, sight, and excellent exposure. The colors are just stunning! Beautiful view! This is just outstanding Steven! brilliant colour tones and amazing level of detail! wonderful work! Nice view, though I'm not fond of the sliced in half tourists at the bottom, edge. Love the rich and colourful textures. Excellent sense of scale with the figures in the foreground as well.